Pareidolia is the fancy name for "Hey, that cloud looks like a [xxxx]." I'm told kids don't develop this ability to distinguish an object from what it randomly resembles until they're about two years old or so. I'm also told I developed it ludicrously early, which is pretty sweet. That said, I didn't see the sailboat in Magic EyeTM pictures until I was 22. I also didn't see a natural rainbow until I was 23. And around the same time I learned to see the Man in the Moon. Honestly, I was looking for a basic smiley face. By the time I realized it was more realistic than that, it seemed easy, though, admittedly, I looked up the information to find it was a left-facing, 3/4 view over the entire face of the lunar surface. For this reason, I am disheartened by the man in the moon. He is tremendously less impressive than a giant orb of cooled molten rock and iron, formed from the spinning detritus of a colossal impact between the newborn Earth and a Mars-sized proto-planet dubbed "Thea" sharing our orbit. 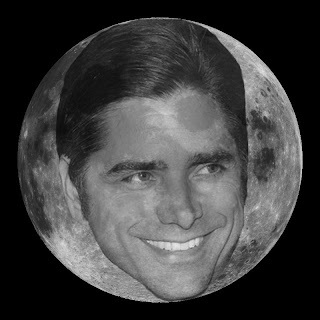 Which is why, from now on, I'm saying the man in the moon is John Stamos. graphic novel I work on, forever.